Appointed is an American brand of desktop tools that launched earlier this year through Kickstarter. I missed the campaign, but thankfully I was gifted by M this beautiful navy workbook and the white adhesive note set. I’ve been using the adhesive notes for a few weeks now, so I thought I would write a few things about them. The adhesive notes come in two pads, inside an open folder. They are made from recycled stock but the paper is very white and clean-looking. Both pads are printed in light gray color: the top one is ruled and the bottom one is graph grid. The adhesive part is on the top edge. (I’ve seen unusual ones where it’s on the left, I kid you not). I don’t understand why, but graph grid is hard to come by in adhesive notes, so my favorite of the two is the grid one. I find it as helpful as ruled but visually more interesting. The matte cover is pleasant on the eyes, too, with neat scoring and simple and beautiful type. The cover makes it easier to carry the notes around; it’s not foolproof protection for the notes but it does provide some. I think the whole set looks very presentable, making you look well prepared wherever you take it. In terms of the paper quality, I don’t expect much out of sticky notes but these are quite nice! The paper feels smooth enough and takes my fountain pens surprisingly well, better than the signature notebook actually. You can see the ink on the reverse-side but who cares about the back side of sticky notes, right? As nice as the cover looks, I wish it came in darker color options, like navy or black. Since it’s in stark white, mine is already showing some scuff marks. The adhesive is on the weak side, although I haven’t had any of the notes fall off on me (I stick them on notebooks). I’ve certainly seen worse. But if you like repositioning adhesive notes, this might be a concern for you. If I were to nitpick further, I would say that the first line (#1) on the ruled version is positioned much too close to the top edge. This means I almost never use #1 in practice. The top of the note is where I “swipe” to stick the note onto things, which means the writing on line #1 can smear (fast-drying inks are OK, but not pencils). The top part is also where the sticky residue can create a different writing surface, so I avoid writing over that area (these notes are actually not that bad in this respect). But as I said, these are just nitpicks. I love the inspiration behind the creation of the Appointed brand and am excited to finally see American-made stationery with sophisticated, minimal design sensibilities. Their launch was pretty impressive but I see that they are already adding more types of products to their shop. And, since this is something I care about with new online shops, I should mention that M told me he had no problem shopping at Appointed’s site. His transaction went smoothly and professionally (they use Shopify under the hood, which is better than e.g. Squarespace checkout in my experience). I’ll admit, at $8 for 100 sheets, these adhesive notes are not the most economical. But I think they make an impressive gift, or a nice treat for yourself. 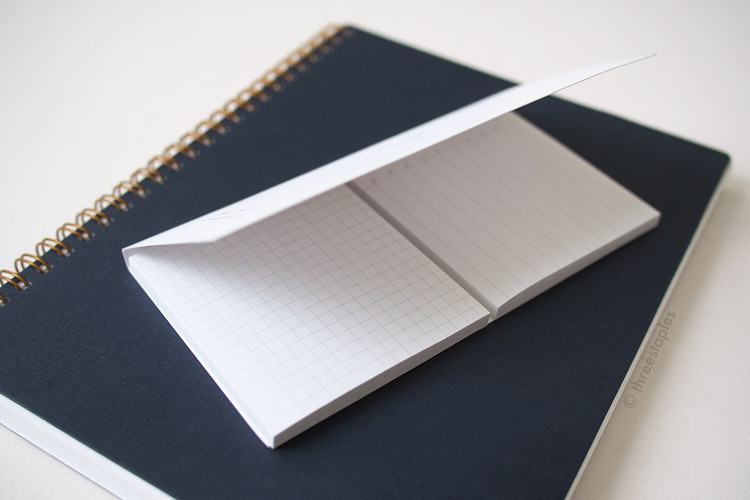 Design-wise, they’re a class apart from the common brightly-colored, blank adhesive notes. And I definitely perk up a little when I reach for them on my desk; they feel so important and grown-up!